Linda Reinstein, the president and co-founder of the Asbestos Disease Awareness Association today released the following statement in response to the United States Surgeon General, U.S. Surgeon General warning that was released today. “The U.S. 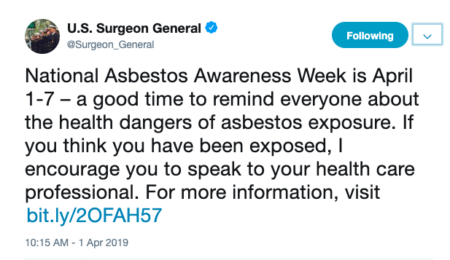 Surgeon General, VADM Jerome M. Adams, sent a tweet to his more than half million followers warning them of the dangers of exposure to asbestos. While many Americans mistakenly believe that the risk of asbestos exposure and related diseases is a concern of the past, asbestos-related diseases cause nearly 40,000 deaths in the United States every year. ADAO thanks Surgeon General Adams for his dedication to our country’s public health and for upholding the responsibility of the Office of the Surgeon General to advise Americans of the harm posed by asbestos exposure. There is a strong global consensus about the deadly nature of asbestos and more than 60 countries around the world have banned asbestos entirely, the United States has yet to take similar action. While promising research continues to help those suffering from asbestos-related diseases, prevention remains the only cure for asbestos-caused disease. ADAO continues to champion a ban on asbestos to prevent unnecessary deaths from asbestos-related illnesses.